Share the post "Custom Validator in Spring MVC"
It may come a time that the existing validators are not sufficient for your needs. In this case you want to create your own validator annotation. The above methods are required when creating custom validators. means that the annotation is applicable in class fields and in class or interface. means that the annotation will be evaluated at runtime using reflection. this define the actual implementation of the interface. The first generic is the annotation interface that this is bind to. The second generic is the type of object that will passed in this validator. Since we are validating the username, then its a string type. The method isValid is the one that will be called during the validation, so you add your logic here. In our case, we just let our UserService to handle if the username exist. This is just an example, and we only check that if the supplied username is “user”. In real life you may need to query your database to check. Now that our custom validator is done, we can now add the annotation to our form object and annotate the field that we want to check. 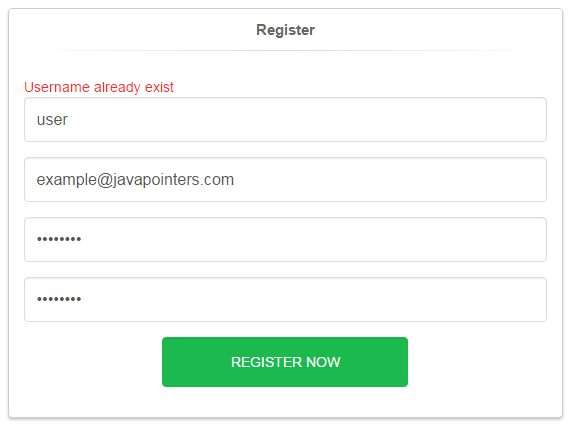 Registering with username “user” should display the error message.